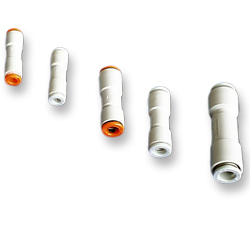 Check valves are typically used in pneumatic-control circuits. A check valve is sometimes referred to as a "non-return valve." These types of valves allow media flow in one direction only. Check valves or "non-return valves" perform the same type of function that diodes perform in electronic circuits.